FoxFiltration has proven technology and a system design that has been used successfully in many Ultra Low NOx burner systems in refineries and chemical plants throughout the U.S. Contact us for a complete copy of the following technical paper excerpt and more information or a quotation. New advances in burner technology have made it possible to reduce the levels of Nitrogen Oxide (NOx) emissions not in marginal percentages but orders of magnitude. The result is that the Federal Environmental Protection Agency is in the process of placing large NOx emitters on notice that in accordance with BACT, they must begin the process of installing ultra low-NOx burners wherever possible. The use of ultra low-NOx burners on gaseous systems has one weakness that can impact not only initial performance but also long-term costs in terms of maintenance and downtime. These new burners utilize a combination of small orifices that are very susceptible to contamination from particulate and hydrocarbon aerosols. Plugging or coking of these orifices and burner tips is much more likely in an environment where the typical fuel gas contaminants get to the burner. Orifice plugging can cause premature performance failure resulting in higher NOx emissions and needless, costly downtime. This problem can be resolved with the selection of an appropriate pre-filtration system. 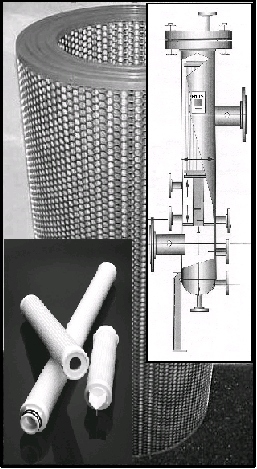 As with most technology advances, new approaches to related systems, like filtration, often comes into play.